It wasn’t a play that would be shown on highlight reels (actually, I did see it run on MLB Tonight once). But time was running late in the Gentleman’s Game – and I held a half point lead over JSquad34 – having just captured the flag from DStars45 an hour earlier with a Mike Trout home run. And then it happened. It didn’t change the outcome of the Royals 5-2 win in Oakland much; but it stole the Gentleman’s Game, a tournament of champions right out from under me late. Franklin Morales drilled Stephen Vogt with a 2-2 pitch. 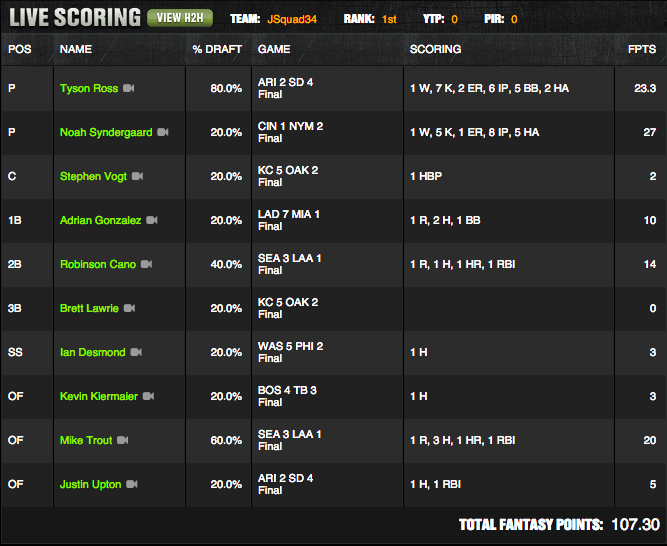 The two points awarded on Draftkings allowed JSquad34 to take a small lead. My hopes went out the window when Efren Navarro didn’t come to the plate in the bottom of the ninth for the Angels. Who the Hell attaches their hopes to Efren Navarro anyways? I deserved to lose. JSquad’s win was his second in a row. No easy task with this bunch. Diamondhoggers got off the mat to avoid another last place finish but it feels half-hearted in not winning the thing after getting that close. The Gentleman’s Game MVP had to be Noah Syndergaard and his 27 points against the Cincinnati Reds. It was a bold move by JSquad34 with all of the great arms that were going last night; he was the only contestant to use Syndergaard. The Gents game turd might have been Giancarlo Stanton, checking in with a zero and owned by 60% of the field at his hefty price, and he broke his damn hand. Our own t3bird04 had a bit of an off night and DStars45 was on vacation. This made for a Gentleman’s Game that should have been ripe for the picking. They’ll be back next week with very solid efforts. 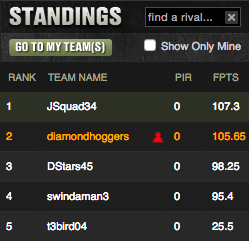 This was a golden opportunity missed by Swindaman3 and Diamondhoggers to gain a ‘5’ in the standings. An opportunity that JSquad34 leaped at.